Petrol blue 500ml (18 oz) stainless steel water bottle made from tough 304 steel. This bottle is highly durable and comes supplied with a quench sports cap (as pictured). Dimensions - Height (inc cap.) - 200mm, Diameter - 71mm. Materials - 304 Stainless steel bottle with BPA/BPS-free polypropylene sports cap. Product Packaging - Recycled card cylinder and tissue paper. One Green Bottle was created by a parent looking for a drinking bottle for her son to take to school that kept water clean, safe and pure. After discovering the concerns arounds chemicals leaching into drinks from plastic as a research chemist, she identified 304 food grade stainless steel as an effective alternative which is also easy to clean and recyclable. 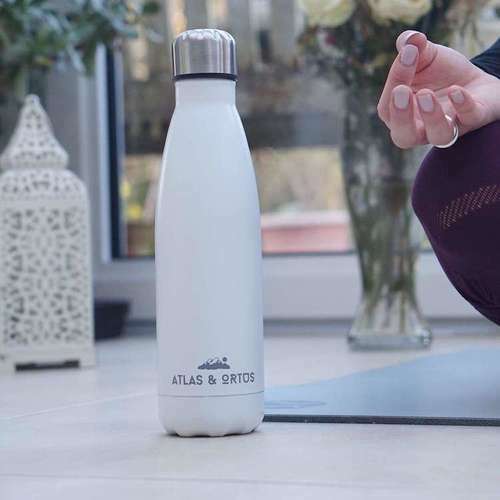 Now they have a range of eye-catching products and they're driven by the fact that their bottles reduce the number of plastic bottles ending up in the ocean. Postage Packaging - Paper mail sack, box or compostable bag. 3-5 working days delivery time.